As such I think between the first two this one is much more enjoyable. I guess I could compare the first volume to a collection of short stories, and this one to an actual novel, or at the very least a novella. The story starts with Toriko and Komatsu traveling to meet up with another of the Four Heavenly Kings, Coco, to go harvest some Puffer Whales. To do this they have to navigate their way through an underground labyrinth to reach the lagoon where the Puffer Whales spawn once every ten years. But other gourmet hunters, and dangerous beasts stand in between them and their prize, while an unknown threat approaches from under the water. Besides seeing a longer fight, the staple of shonen adventure manga, we also get to see Toriko pull out yet another more advanced fighting technique. We also get to see Coco’s unique combat skills, which I especially like because not only do his abilities make sense, using manga logic that is, but they also go beyond being something cool for the character to do, and instead define who the character is, as well as his outlook on life. The main fight of the storyline is a lot of fun, and allows more focus on Coco, rather than Toriko, which at this point I think works, because we already know how Toriko works. 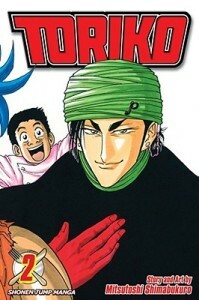 There’s still more that can be explored, but I think getting a broader look at the different characters that will make up the Toriko story is a good idea. Even if those characters are similar to characters from other shonen manga, like I said in my review of volume one, I like to think of it as being reunited with old friends, rather than coming across a cast of copy cats. The manga ends before the payoff for this arc, so there is a definite pull to read the next volume. As with the past two stories, one of the best parts of this manga is finally seeing the characters eating what they set out to capture. There are, however, two downsides to this storyline. First of all, and this is a more minor complaint, I’m not a huge fan of how Shimabukuro pulled a DBZ and gave Toriko an attack that he has to charge up first. Keep in mind, and this is a minor spoiler, he never has to charge that attack again, he can use it from the get go every other time he uses it. So really it wouldn’t bother me, except for that it was used solely as a plot device to force Coco to fight on his own for a bit. The second complaint is that Toriko strays from the likable, slightly self centered protagonist so common in other series, and becomes a legitimately thoughtless jerk. I think it’s a case of the author going a tad bit too far, as it doesn’t go so far as to make him unlikable, but it is a minor concern of mine, and once you watch the anime I’m sure you’ll see that Toei Animation had the same concern. And for those of you that like Easter Eggs, put this volume next to the first volume. Neat, huh? Almost makes up for the excessive use of white space on the two covers, doesn’t it? At least there’s a point to it, unlike some other manga I could probably name.